- Refugees: What can we do? 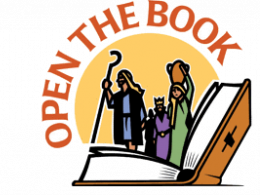 OPEN THE BOOK is a programme of acted and themed Bible stories which take place regularly in our Church School – Downton Primary School in Gravel Close. St Laurence’s Church has a dedicated Open the Book Team which visit and deliver the stories in the afternoon Worship in the school. The team of volunteer storytellers came together in March 2013 after they had attended an Introductory Training session at the Salisbury Diocesan Centre at Wilton. Now after many memorable Open the Book sessions, the Team have developed their roles by using drama, mime, props, costume - even the children and staff themselves - to present Bible stories in ways that are lively, engaging, informative ... and great fun for everyone involved! Another ‘Open the Book’ storyteller is Rev Ron Hart who visits the school on other days in the month and often involves the children in his stories. The school staff and children thoroughly enjoy the visits from the Open the Book Team who often get recognised out and about in the Village by the children. One of the charities we regularly support is The Trussell Trust in Salisbury, which works to help local communities to combat poverty and exclusion in the UK and Bulgaria. The Trussell Trust runs a network of over 420 foodbanks, including one in Salisbury, which provide a minimum of three days emergency food and support to people experiencing crisis. In St Laurence Church we have a regular collection of tinned and dried food which we take to the Trussell Trust on a monthly basis. Items can be brought to church on Sunday morning or to The Vicarage in Barford Lane at other times. A list of suggested items is on The Trussell Trust website and also below. (usually prior to Christmas), to help sort food donations and pack food boxes. collection would be much appreciated. A huge thank you to everyone for your very generous support for our Trussell Trust Christmas Appeal. Our collection this year was for 50% general items and 50% Christmas treats, and it weighed in at amazing 178.7kg. We also passed on some generous cash donations to the Foodbank. The Trussell Trust is very grateful for all our support. A big thank you to everyone who has supported, and continues to support, our regular collection for the Trussell Trust Foodbank. We have now collected an amazing 5 TONNES of food since we began in 2006. This amount does not include all the food collected at special times of the year such as Harvest and Christmas. The Trussell Trust is very grateful for the support it receives from many local churches including St Laurence. Refugees: What can we do? None of us can have missed the distressing stories of those who are fleeing the violence and chaos of the Middle East. Among the key requirements of our faith is the need to show hospitality and kindness to strangers. The question is, though, what can we actually do? The Bible tells us ‘Deal with each other justly, do not oppress the refugee, the fatherless or the widow, and do not shed innocent blood. Journey in all the ways I command you, that all may go well with you.’ (Jeremiah 7, 6-7). Also we know that Jesus himself was a refugee from Herod in Egypt. Encourage: We can encourage people, especially landlords, to think about how accommodation might be offered. Citizens UK have launched an appeal for homes and more information can be found on the Citizens UK website. Pray! To help you there are prayers displayed in St Laurence Church. Also Christian Aid has resources for prayer and vigils on their website. Donate: the British Red Cross is calling for more funds to support affected people in Syria and neighbouring countries. See their Emergency Syria Crisis Appeal page.